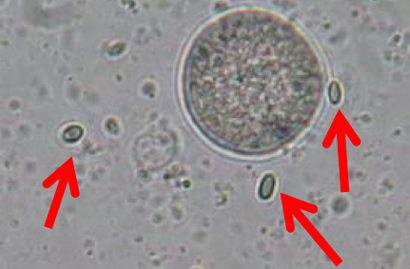 Nosema spores (red arrows) in a sample with pollen and tissue debris. The microsporidia Nosema apis (Zander) and Nosema ceranae (Fries) are common intestinal parasites in honey bee (Apis mellifera L.) colonies. Though globally prevalent, there are mixed reports of Nosema infection costs, with some regions reporting high parasite virulence and colony losses, while others report high Nosema prevalence but few costs. Basic and applied studies are urgently needed to help beekeepers effectively manage Nosema spp., ideally through an integrated pest management approach that allows beekeepers to deploy multiple strategies to control Nosema when Nosema is likely to cause damage to the colonies, rather than using prophylactic treatments. Beekeepers need practical and affordable technologies that facilitate disease diagnosis and science-backed guidelines that recommend when, if at all, to treat infections. In addition, new treatment methods are needed, as there are several problems associated with the chemical use of fumagillin (the only currently extensively studied, but not globally available treatment) to control Nosema parasites. 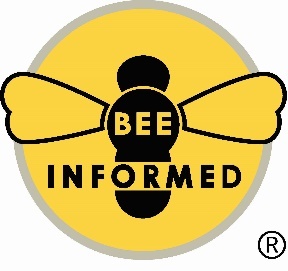 Though selective breeding of Nosema-resistant or tolerant bees may offer a long-term, sustainable solution to Nosema management, other treatments are needed in the interim. Furthermore, the validation of alternative treatment efficacy in field settings is needed along with toxicology assays to ensure that treatments do not have unintended, adverse effects on honey bees or humans. Finally, given variation in Nosema virulence, development of regional management guidelines, rather than universal guidelines, may provide optimal and cost-effective Nosema management, though more research is needed before regional plans can be developed. Read the rest of this journal article here.